The Spectra Nomad 900XC Data Collector is a powerful handheld computer used by surveyors for collecting, calculating, and saving land data in the field. With Spectra Survey Pro Robotics on-board software, Bluetooth, GPS, Wi-Fi, WWAN, camera, touchscreen and Windows OS, it allows you to collect land data by hand even in areas that are inaccessible due to poor field conditions. The Nomad 900XC is equipped with a microprocessor, 2 GB internal memory for data storage and wireless capabilities for data transfer. This device is battery powered, portable, has a built-in keypad, LCD display and field software that boost efficiency and productivity in topographic surveying, mapping, and construction projects. In addition, this handheld field computer can be used as a stand-alone device or in conjunction with total stations and personal computers for viewing, analyzing and manipulating collected land data. 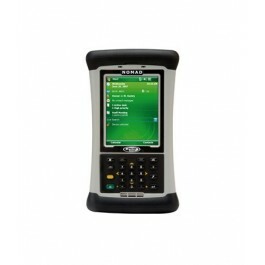 The Spectra Nomad 900XC is equipped with a Windows Mobile 6.1 operating system that easily runs a variety of applications. This surveying instrument is preinstalled with mobile versions of Internet Explorer and Microsoft applications such as Word, Outlook, PowerPoint, Excel, Pocket OneNote, and Media Player. It also includes Microsoft ActiveSync, which allows for desktop control from the handheld. The Nomad 900XC Data Collector comes with built-in Spectra Survey Pro Robotics software. This fast and reliable on-board software gives a comprehensive set of tools to collect and organize your survey data efficiently. You can use it for data collection, calculation, mapping, data storage, data management and data transfer to your laptop or PC. Spectra Survey Pro Robotics shares all Survey Pro functions, works with all major brands of robotic total stations, and adds graphical staking screens and is also compatible with AutoCAD – the popular computer-aided design and drafting program used by architects and engineers. Spectra’s Survey Pro Robotics software has a user friendly interface, giving complete control to manipulate survey data. With a customizable home screen, you can configure your favorite choice of field processes to optimize daily workflow.